"This is no "Brat-3", this is War"
Set in small town Juliette, MS, in the 1970's, The War opens with Stu and Lidia Simmons rushing to meet their war-veteran father, Stephen Simmons. The next morning in the Simmons tiny shack of a home it is showed that Stephen is suffering from post traumatic stress disorder when he unknowingly attacks Stu as he tries to wake him. Stu accompanies his father into town and has a brief violent run in with another boy his age, Lester Lucket. Stephen explains to Stu how unnecessary war can be and how important it is to control your anger. Lidia and her friends, Elvadine and Amber, are busy collecting junk from Mr. Lipnicki's junkyard to build a tree fort. Stu and his friends, Marsh and Chet, also have plans to build a fort but discover Lidia is already at the tree building hers. Stu challenges Lidia to a race for the right to build a fort on that tree but loses. Stephen instructs them to share the fort. Stephen loses his job as a janitor, but finds a better paying job in a coal mine. He has his heart set on buying a nice house for his family. When the house is up for auction, Stephen and Stu go together to the County Fair to bid on it. They have a run in with Mr. Lipnicki, and Stephen keeps his temper in check to set a good example for his son. An accident happens at the coal mine and Stephen is injured trying to help his friend. Stephen ends up hospitalized in critical condition. 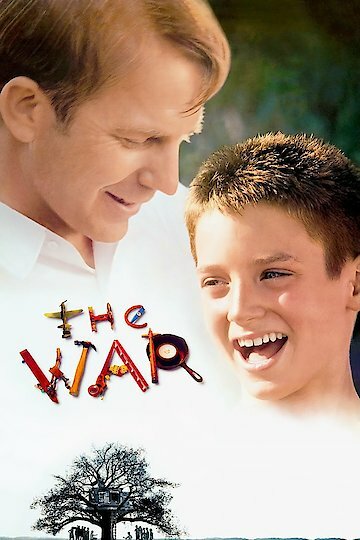 The Lipnicki children attack the Simmon's fort, and Stu challenges Leo Lipnicki to swim across the water town as it drains for rights to the fort. Stephen dies, and Stu reacts in anger. A war soon breaks over the fort, and in the midst of it all Stu realizes his father was right about violence. In the chaos, the youngest Lipnicki, Billy, climbs into the water tower and falls into the whirlpool. Stu and Leo rescue and resuscitate him. In the end of the movie Stephen's bid is accepted and the Simmons move into their new house. The War is currently available to watch and stream, download, buy on demand at Amazon Prime, Starz, Amazon, Vudu, Google Play, FandangoNow, iTunes, YouTube VOD online.